From time to time, we are reminded that no matter we who are, where we are, nature does not play favorites nor are odds stacked against us in one way or another. Sometimes life just happens, good or bad. Besides blazing heat in Los Angeles last month for all of a week, we've been fortunately and devoid of natural disasters. But our moderate quake yesterday reminded the whole city that we can have the BIG ONE happen at any time, between now and 32,000 years from now. So, being prepared is a for any situation is key to waiting out natural disasters and some man-made ones. How do mobile warriors and gadget lovers cope and prepare? 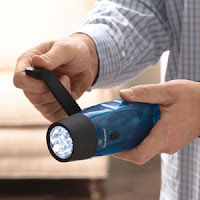 Earlier this year, I purchased a hand powered flashlight that requires no need to for battery changes. All that's needed is for the user to crank the handle for about half a minute to generate power for about 15 minutes. This is very important in an environment where you could be out of power for hours if not days. And it's durable. You can pick up one of these at Brookstone. Outside of my Samsung Trace and iPhone, they are my online wireless link to the world should my DSL access ge knocked out along with telephone line. But we found out yesterday that while one of oldest and most reliable form of communication isn't so reliable when everyone tries to use it at the same time, texting, IM, e-mails, and, possibly, video conferencing was still chugging along quite nicely. I cannot stress the need for a portable powersource. I'll admit that besides a solar charger I bought to power my mobile phones, I have no other reliable source of power. I'm still a few years away from installing solar panels and, even then, I'm still not 100% sure about being able to be completely self-sufficient then. So, if what other options do we have to stay in touch? The answer? The radio. I'm looking for just such a device. 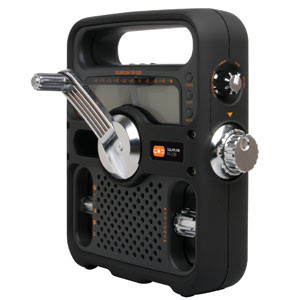 It's a solar powered radio that is powered by a solar panel during the day and, if needed, it has a hand crank as well. Also, it does take batteries as well. You can also pick up one of these at Brookstone. Although there are other similar options at Amazon. Still gadget lovers can life off his or her mobile devices. You still need to make sure you've got plenty of good and water. Not to mention a first aid kit. I'll be polling readers and good folks I know to see just what mobile warriors need to do and create a guideline to share with everyone. It'll be an "open source' project of sort that will continue to be revised over time as we get more and better information. Note: I'm looking for solar information to my Powerbook/Macbook. I would appreciate any suggestions.